If you are looking for a building contractor in Sac City, IA, let Greiner Buildings be the first one you call. We have been Iowa’s most trusted builders for the past 25 years, and have earned a fantastic reputation in the area. 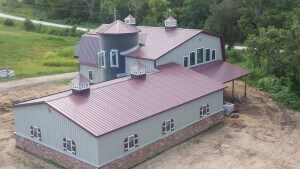 Our professional team regularly constructs commercial buildings, custom homes, hobby shops, agriculture buildings, horse stall barns, cattle buildings, machine storage sheds, mini storage units, and more. Whatever your custom building needs are in Sac City, IA, we can make them happen for you. Here at Greiner, our team is known for our quick construction, high quality materials, and helpful customer service. We strive to build according to your specific needs and requirements, and our goal is to fulfill the vision and dream that you have for your custom building. Our design team can help you by coming up with a 2D and 3D CAD Design to visualize your building beforehand. Whatever you are looking to build, we can provide you a detailed quote free of charge. If you work out of a shop, you may be interested in the Shome™ – an original Greiner creation. This building is a unique combination of shop and home – allowing you to work or practice your hobby from the comfort of your home. Not only do we offer new construction, but Greiner Buildings specializes in building restoration and repair. If you have an old barn that has been in the family for years, let us restore it for you while still keeping it’s old charm. We also offer General Contracting and Project Management services for contractors in Sac City, IA and the surrounding area.